It’s not every day you get something for free with no strings attached. But it’s true in this case. The Galileo K-12 Online system now comes with an innovative, flexible Digital Curriculum Platform at no additional charge. Our team of engineers have created a dynamic solution for seamlessly integrating standards-based differentiated instruction, comprehensive, reliable, and valid assessment, and they’ve created an easy way to access actionable reporting from the Galileo Dashboards. Creating a curriculum platform that would support educators was really important to us. We spoke to several educators and teachers and discovered what would be helpful in an online curriculum platform. The system has user-friendly tools making getting started easy and intuitive. The Platform supports the ability to incorporate existing curriculum and lessons, develop new curriculum and lesson plan content, and share and modify curriculum and lessons online. With the Galileo Platform it’s now possible to build the curriculum to suit your district or charter needs. 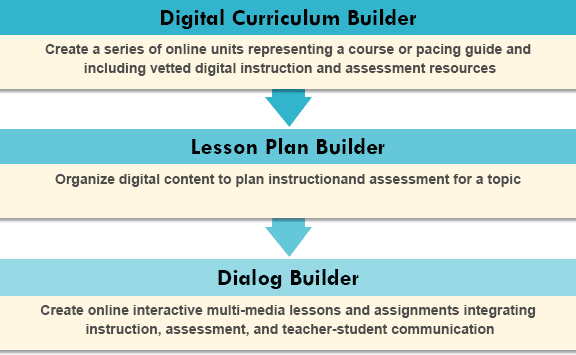 Curriculum builder tools support the inclusion of multimedia instructional content within courses, units, lessons, and activities. And it doesn’t stop there. Data from integrated assessment of student learning is available to inform decisions regarding the next instructional offerings and possible modifications of the curriculum itself. The Platform also enables searching for and scheduling popular instructional resources including those from KHAN ACADEMY®*, LearnZillion and ATI prebuilt Instructional Dialogs. 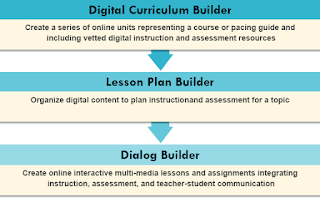 Learn more about the various Galileo Digital Curriculum Platform benefits. *KHAN ACADEMY® materials are also available for free at www.khanacademy.org.